This time last year I was house sitting for a friend so he could go off to be with family. I spent the holiday alone for the first time in my life. Thanksgiving has always been my favorite holiday. It is so much about coming together, sharing and giving thanks. But I was nearing the end of a long confusing road full of hurt. I was about as alienated from my own existence as one can get. I was still in the closet and just thankful for the time to be alone without the assumptions of the world. It was just me and a couple of cats, they don’t assume they just merely expect. I also realized in that time alone that it was high time I confronted my deepest fears. It was time for me to learn to give thanks. In the year that has followed I have found true acceptance of who I am as a person. I have found that instead of finding more pain as an openly trans person I have found a level of joy I didn’t know I could have. The other day I was looking through old photos. Often a hard thing for we trans folk. 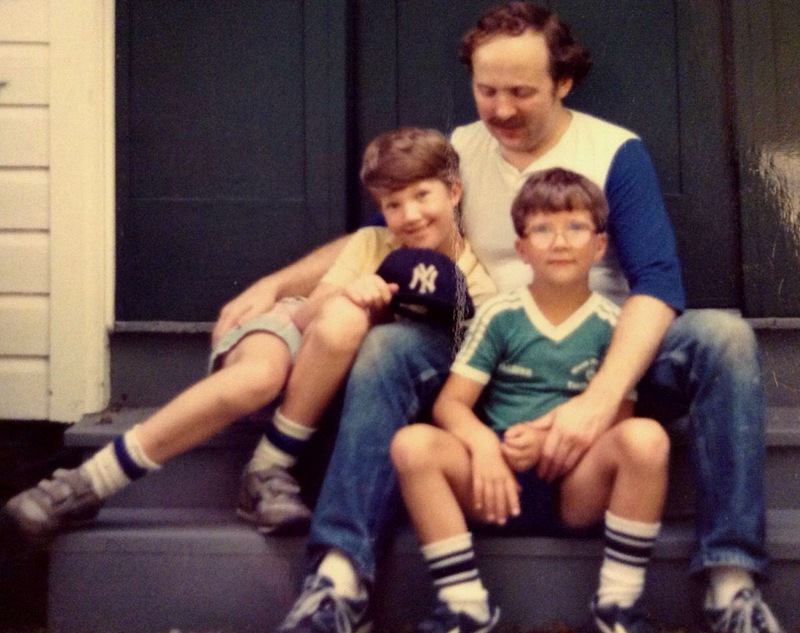 I found a series of photos my Mom had snapped of me, my brother and my father on the stoop of our home in New Jersey. When I used to look at it I would see my Pop and brother looking very male. And in from the side, baseball hat in hand as a token of maleness, I saw the awkward kid who I could never understand. I would wonder why I couldn’t be like them no matter how hard I tried. But now just before this Thanksgiving, I saw the same photo through new eyes. I saw the goofy tomboy I have always been, leaning impishly on my Poppa’s knee. I thought I looked cute! My life makes sense to me now and quite frankly I have learned a lot from all the pain I have been through. My teens and twenties weren’t all bad but I have gotten to reconnect with that impish, goofy tomboy I had been so long ago, before testosterone and before I repressed my soul out of fear. Now I get to share that oh so important goofy tomboy part of me with the world every day. Yes, I am so glad to be trans. So very thankful that I have been able to embrace it at last and that I can celebrate it as a fact. I can look back on my life with joy and tears alike. I feel so complete! Even more so I can look to the future with a new hope and purpose of being. I truly am most thankful to have been born transgender.